This Benjamin Franklin letter was written to Jared Eliot in 1753 and is part of a series of letters Franklin wrote to various friends about his electrical studies and observations. Several of these letters were put together in a book called "Experiments and Observations on Electricity Made at Philadelphia in America" by his friend Peter Collinson, who was a member of the Royal Society in London. This book became the most reproduced book of the eighteenth century and made Franklin famous throughout Europe and America. Many years later this fame was responsible for Franklin receiving the help of the French government on behalf of the Americans during the Revolutionary War. In this letter, Franklin answers a question sent to him by Mr. Eliot and refers to the letter of thanks written to him and the Royal Society from the King of France. You can read the other letters in the series at our Benjamin Franklin and Electricity letters page here. I received your Favour of March 26. and thank you for communicating to me, the very ingenious Letter from your Friend Mr. Todd, with whom, if it may be agreeable to him, I would gladly entertain a Correspondence. I shall consider his Objections till next Post. I thank you also for the Hint concerning the Word Adhesion, which should be defin'd. When I speak of Particules of Water adhering to Particles of Air, I mean not a firm Adhesion but a loose one, like that of a Drop of Water to the End of an Icicle before freezing. The firm Adhesion is after it is frozen. I conceive that the original constituent Particles of Water are perfectly hard, round and smooth. If so, there must be Interstices, and yet the Mass incompressible. A Box fill'd with small Shot, has many Interstices, and the Shot may be compress'd because they are not perfectly hard. If they were, the Interstices would remain the same, notwithstanding the greatest Pressure, and would admit Sand, &c. as Water admits Salt. Our Vessel, named the Argo, is gone for the N.W. Passage; and the Capt. has borrowed my Journals of the last Voyage, except one Vol. of a broken Set, which I send you. I enclose a Letter from our Friend Mr. Collinson: and am promis'd some Speltz which I shall send per next Post. Go back to the Ben Franklin Electricity letters list here. 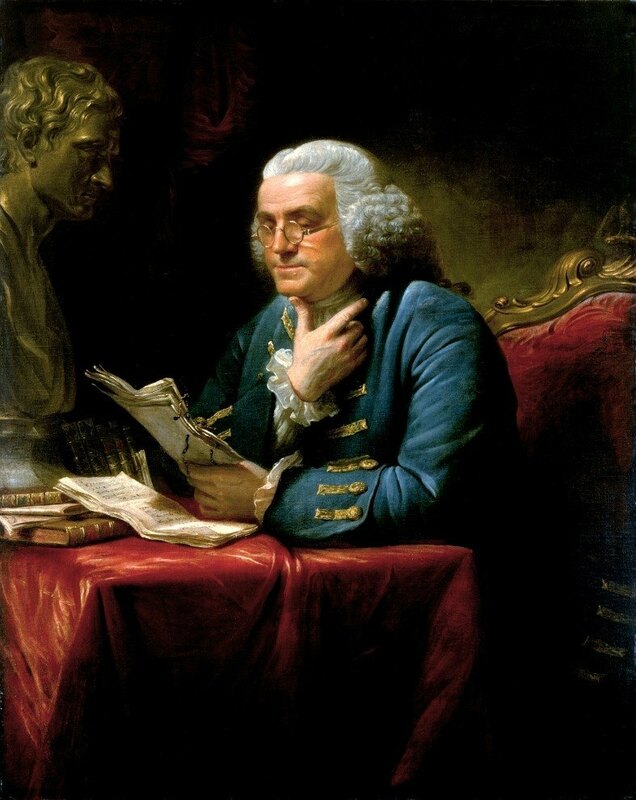 You can also read about the history of Benjamin Franklin's studies on electricity here. Check out our Facts about Benjamin Franklin here and check out our Ben Franklin Quotes here.